Happy Spring, my peeps! Can you believe it? We survived the Winter and now here we are on the other side. It sure feels great! Here in the Northeast, we had a few weeks of unseasonably warm weather (I’m talking in the 80’s! ), and now it’s cold again. But I can deal! The sun is shining and the bulbs are peeking up; I know we’re headed for warm weather soon enough! How is it Easter week already? Seriously. It’s been busy lately, for a food blogger! We had St. Patrick’s Day and Pi Day practically on top of each other, and boom. Now it’s Easter. It’s really early this year, right? If you’ve got bored kids on Spring break, this could be a really fun project to do together. It all starts with your favorite cupcake recipe. I am all about this White Cupcake recipe right now. I added a little lemon zest to the batter to make it extra Spring-y. But you could even use a store-bought cupcake, just make sure it’s unfrosted. While the cupcake you use doesn’t really matter all that much, the frosting actually does. As you can see, these cupcakes are frosted on all sides, so you really need to use something that can crust over. This way your hands won’t get all messy when you pick one up. 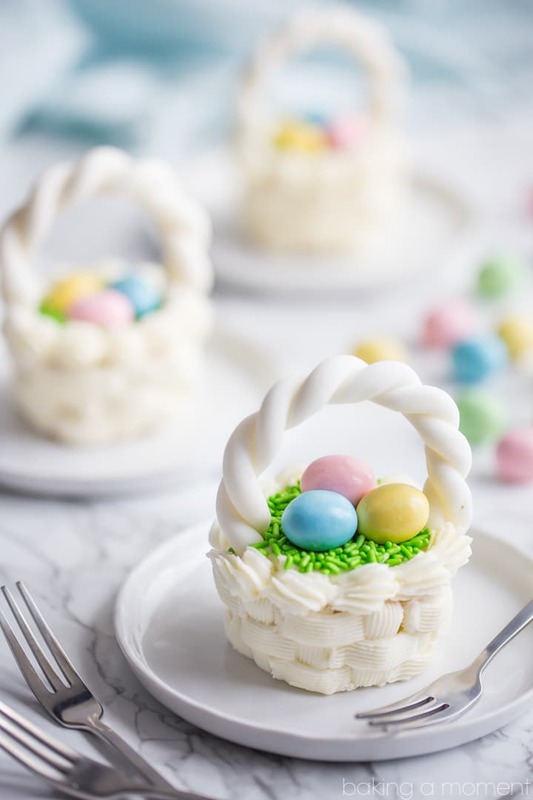 My all-time favorite frosting is a Swiss meringue buttercream, and I’ve got tons of recipes on this site to prove it. I’ve actually been accused of being a buttercream snob! And I can’t deny it- I’m just so in love with the silky, light texture. I also love how easy it is to frost a cake with it, because it stays workable indefinitely. In other words, it doesn’t get dry/hard on the surface when it’s exposed to air. Most of the time, I consider that a good thing, but there are times when you actually want that, and this is one of them. 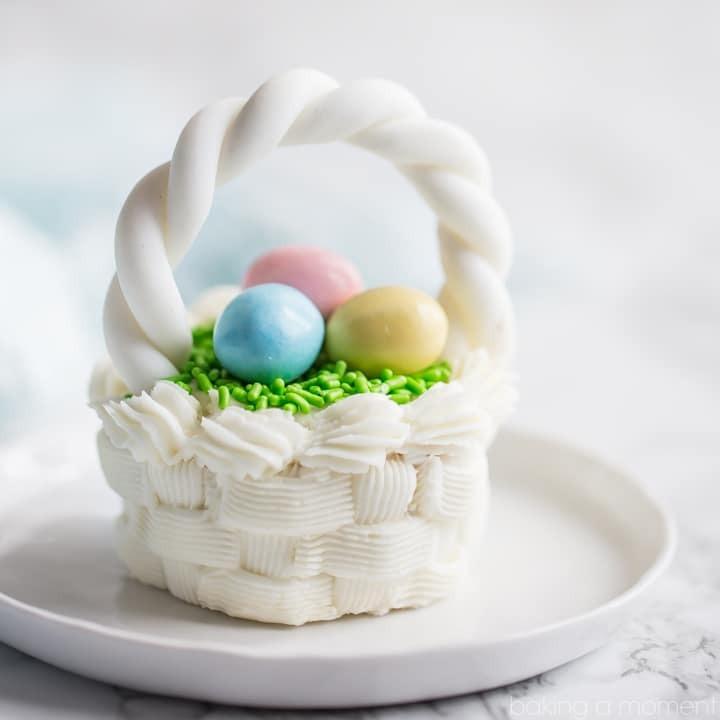 So, I’m recommending this American-style buttercream for these adorable basketweave cupcakes, and for anything else piped that needs to be a little stronger. It’s simple as can be, just butter and powdered sugar with a little cream to keep it smooth and spreadable. You can add any extracts you like, but I’m partial to vanilla, lemon, or almond. Now I’m sure you’re wondering how the heck it’s possible to create this intricate design, right?! You’ll be shocked at how simple it really is. I’ve listed and linked to all the supplies you’ll need in the recipe card below, and put together a little video tutorial to show you how it’s done. Enjoy! Roll about 1 ounce of fondant into a rope, about 10-inches long. Fold the rope in half and twist. Drape the twist over a rolling pin to create a curved shape. Allow to dry/harden for a few hours or overnight. Make the White Cupcakes according to the recipe directions. Cool completely, and remove cupcake papers. Make the American-Style Buttercream according to the recipe directions below. Transfer the frosting to a piping bag fitted with a coupler and a #48 tip. Pipe the frosting on the sides of the cupcakes, in a basketweave pattern (see video above). Remove the tip and pipe a flat layer of frosting over the top of the cupcake. Add a #22 tip and pipe a shell border around the top edge of the cupcake. 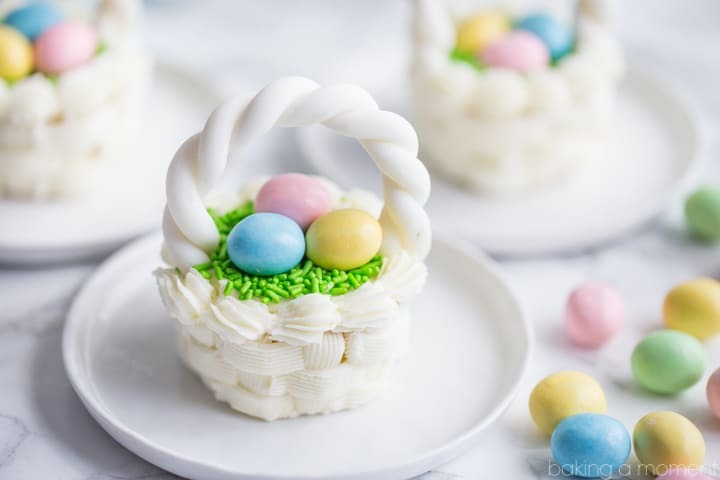 Top the cupcakes with green sprinkles and Easter egg candies. Set the fondant basket handles into the soft frosting. Place the softened butter and salt in a large mixing bowl and beat together until creamy. Add the powdered sugar, 1 1/2 cups at a time, mixing on low speed until fully incorporated. When all the powdered sugar has been mixed in, add the almond extract, turn the mixer speed up to medium-high, and whip until fluffy (about 3-5 minutes). Pour the heavy cream down the side of the mixing bowl, in a slow and steady stream, while whipping. It's best to let the frosting dry a bit before serving, so the cupcakes can be more easily handled. If it’s possible to be killed by cuteness then consider me six feet under. I love this!!! Haha Jessie you are so funny! Thank you so much for the sweet compliment. Hope you are enjoying this first week of spring! Allie, LOVE the video and these Easter basket cupcakes!!! SO CUTE! I’ve never made white fondant before but now I’m going to try! Great video!!!! And these cupcakes are so adorable! Girl this is just beyond darling! I can’t even stand it! These are so cute! Sharing! These are stunning! 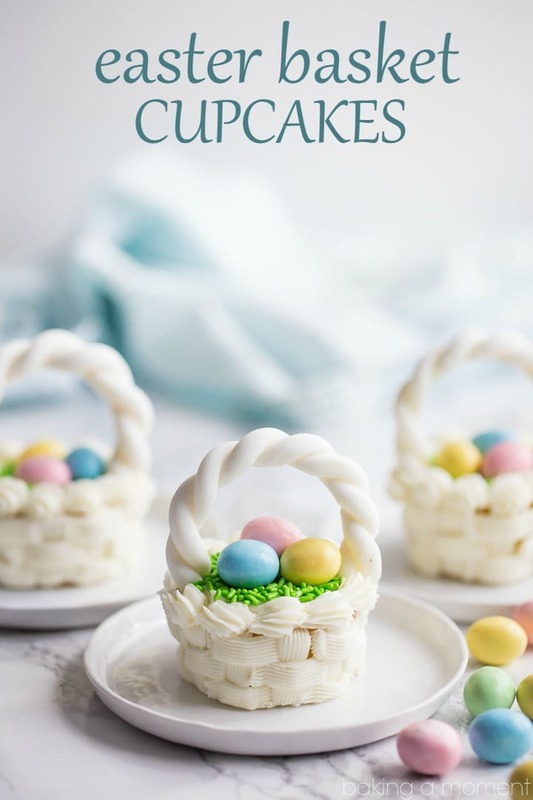 That’s so creative to turn cupcakes into Easter baskets, and I love the green sprinkles as Easter basket grass. So cute! Thank you so much! I had a lot of fun figuring out what to use and then seeing how it came together. Enjoy your day, dear! These are so so creative and pretty!! Can I ask – how to you add right at the end ”Learn More – Get the Recipe!” and have it click to the blog??? Rebekah you mean for my Facebook post, right? When I upload the video to Facebook those are all options. I just fill in all the blanks for tags, title, call to action, etc. Hope that helps! How completely and utterely adorables are these!!!!! LOVE them!!! Allie, these are just WAY too cute!!! Anyone who gets this for Easter is so very lucky! These are adorable and I loved your video! SOOOOO CUTE! and omg the buttercream looks so heavenly! We made this last night and the kids loved it! 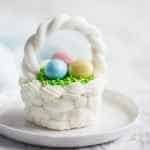 Hi, I have been searching for a new American-style buttercream recipe, as my old trusty recipe calls for Brite White, however my daughter was recently diagnosed with Celiac , and now follows a gluten free diet. Your recipe looks like it may be my answer- I just need to know how much it makes? I need a large enough quantity to cover a 2-layer 9” or 1/4 sheet, plus extra for decorations. My old recipe called for 3lbs of powdered sugar and 2C of shortening, and 1C Brite White. Please advise, thanks! Hey Heather! I’m so sorry to hear about your daughter’s diagnosis. Hopefully this recipe will help make things a little easier for you both. I think that you will definitely have enough frosting to cover a 9 inch double layer cake or 1/4 sheet cake with this. You might even have some left over. Good luck and I hope you both enjoy! Have fun and enjoy Brenda!